Ranujee Jewellers was established in the year 2003. We are engaged in manufacturing, exporting, retailing and trading of Diamond Jewellery and Precious Stone Jewellery. Our range of jewellery includes Diamond, Gold and Silver jewellery with color stones. Our Diamond and Precious Stone Jewellery is handcrafted by our talented and expert team who design these sets as per the specifications provided by our clients. These sets are available to our clients at cost effective prices. We provide wide range in different customized options as per the various needs of our customers. By offering quality assured jewellery to our clients, we are counted among the foremost manufacturers and trader in the market. Our expert team who consistently checks the quality and believe in strict quality procedures. Our experienced and qualified team of professionals uses premium quality gems and stones to produce these products. 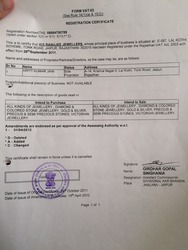 With the support of our mentor Mr. Rajesh kumar jain, we captured market for our products in the industry. 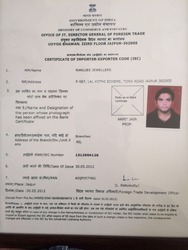 His industry experience and ability to cater the needs of the clients made us create a name for our company. Ranujee jewellers is engaged in offering exclusive range of gemstone and white gold jewelry, yellow gold jewellery and victorian jewellery which is perfect of style and elegance. Our collection is made of finest quality gemstones and gold. Available in various colors, sizes, texture and designs, our range of jewellery is trendy and appealing. We also customize our range as per the client's requirements. We have a large manufacturing unit for designing jewellery. These are crafted in accordance with the customer’s requirements and specifications. This unit is managed by team of experts who use premium quality materials and according to the latest trends. These experts are highly qualified and experienced. They are known for their special features like elegant design, long life. We provide international quality standards to the clients. To have a strong , globally diversified infrastructure for manufacturing/marketing of diamond and golg jewellery. Create enterprise and brand value to increase the net worth of the group. 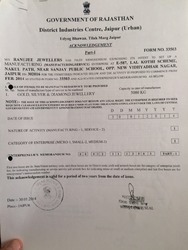 Registration Certificate of Ranujee Jewellers. Integrity, Solidarity, Credibility & Perfection are the pillars on which we stand. Ranujee's succes story is the result a farsighted strategy, painstakingly crafted over last 35 years. "At every step, Ranujee translates its vision into a vibrant, shining, reality visible to all. With careful positioning, immense instruments, dedicated effort, unique creations, quality assurance and timely delivery has brought us at the crest of a wave that is moving upwards with great momentum." We are a prestigious name in manufacturing and exporting a wide collection of gemstone jewelery that is in line with latest fashion trends. These jewellery add elegance to your persona.